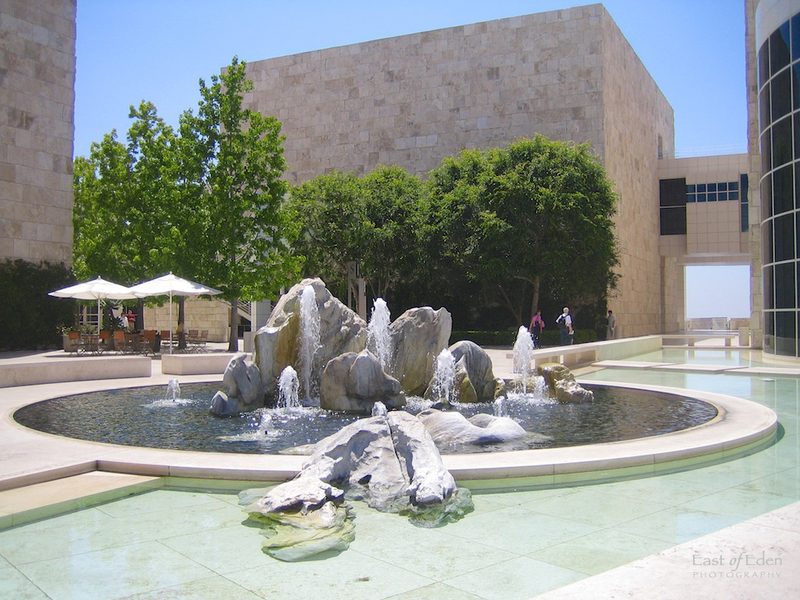 The J. Paul Getty Museum’s collection is divided between the Getty Villa, in the Museum’s original location above Malibu, and the newer Getty Center in the Santa Monica Mountains off of the 405, across from the University of California, Los Angeles. 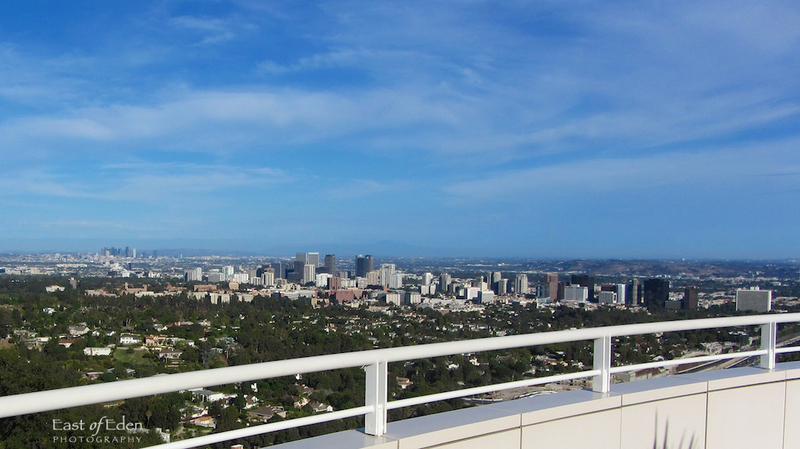 After fourteen years of planning, design and construction, the J. Paul Getty Center in Los Angeles opened to the public in December 1997 to great critical acclaim. 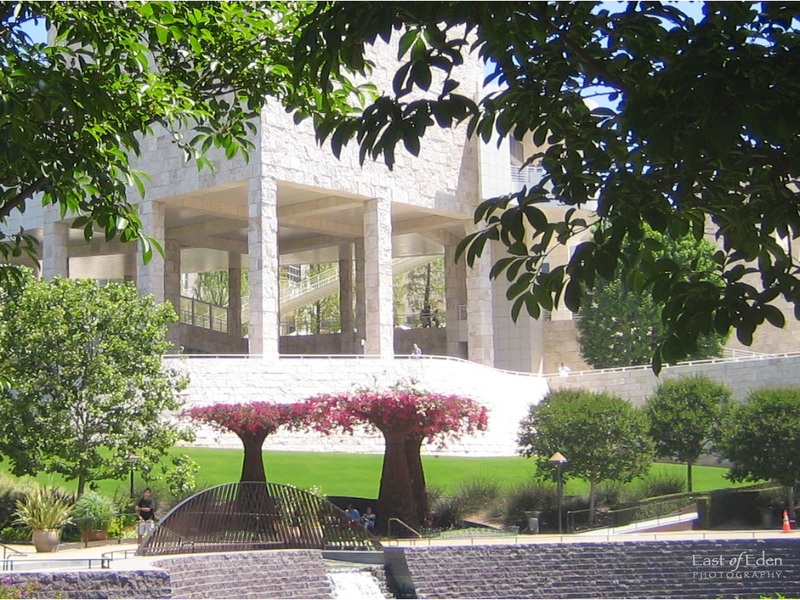 The Center comprises the J Paul Getty Museum, five separate arts and humanities institutions, and landscaped gardens and terraces on a 110-acre site. This hilltop fortress has some spectacular panoramic views of L.A.: the Pacific Ocean, the San Gabriel Mountains, and the gridded streetscape of the city below. 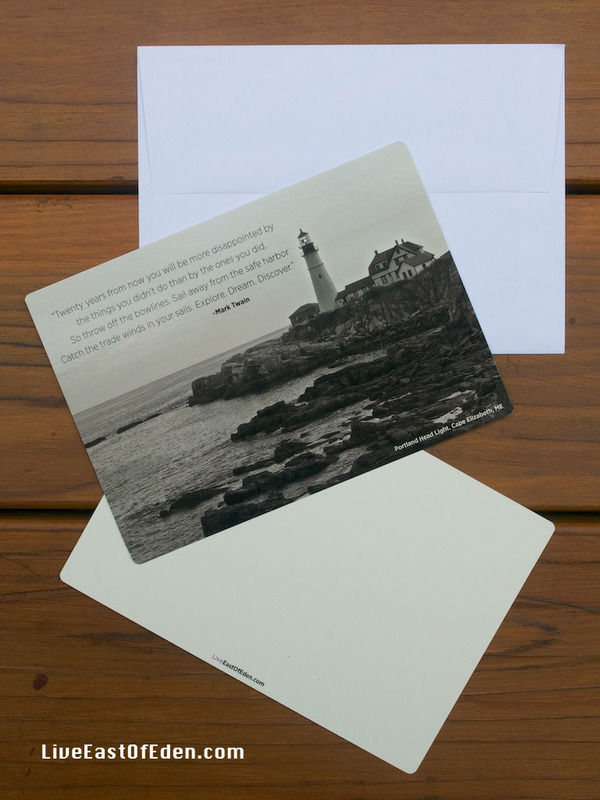 Inspired by the relationship between the ocean, the mountain and the city, architect Richard Meier designed the complex to highlight both nature and culture. When approached from UCLA to the south, the complex appears to grow from the 110-acre hillside. Two computer-operated trams transport visitors from a street-level parking facility to the top of the hill. Curvilinear design elements and natural gardens soften the grid created by the travertine squares. Shallow water features, like this one in the Museum Courtyard, containing boulders and travertine blocks are found throughout the Center. As the light changes, so does the color of the water and the stone. The building stone is travertine, from Bagni di Tivoli, Italy, the same source as the Coliseum, Trevi Fountain and St. Peter’s Basilica colonnade. 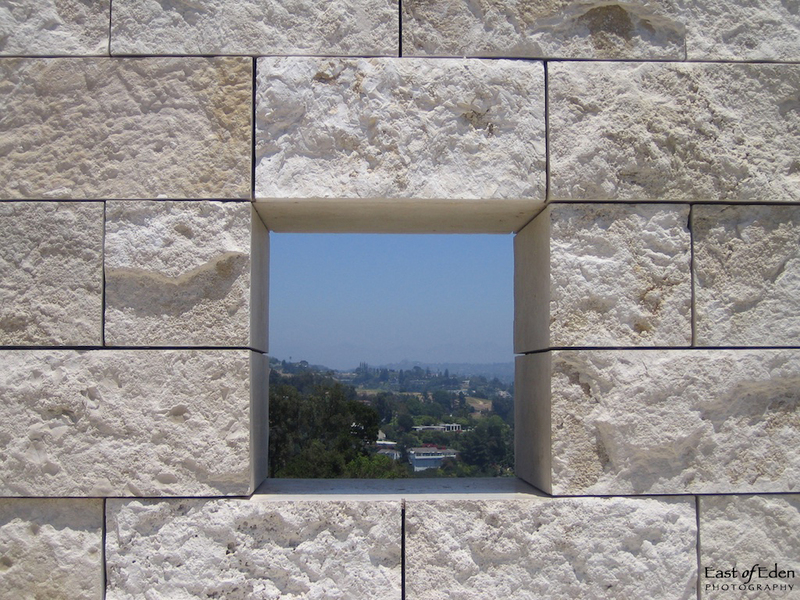 Meier chose stone for this project because it is often associated with public architecture and expresses qualities the Getty Center celebrates: permanence, solidity, simplicity, warmth, and craftsmanship. The stone – about 1.2 million square feet, or 16,000 tons, is one of the most remarkable elements of the complex. Split along its natural grain, many of the stones bear fossilized leaves, feathers, and branches. This beige-colored, cleft-cut, textured travertine catches the bright Southern California daylight, reflecting sharply during morning hours and emitting a honeyed warmth in the afternoon. 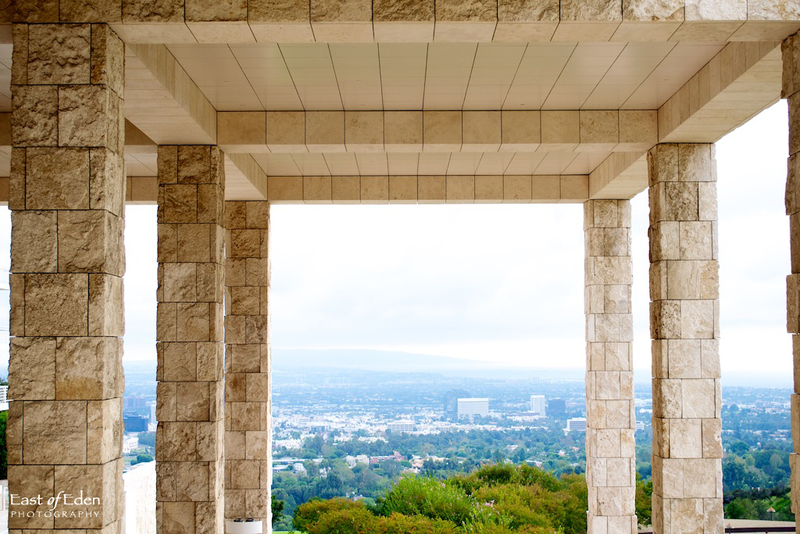 The Getty Center is a work of art with a museum inside! Closed Mondays, January 1, July 4, Thanksgiving, and December 25. Classic Hollywood Glamour. Decorated by famed interior designer Mary McDonald, the 162 guestrooms and suites at our Bel Air hotel retain simple elegance while featuring the latest in comfortable amenities for your stay. Luxe Sunset Boulevard Hotel is a gem among L.A. luxury hotels. Stay with us and immerse yourself in California decadence. Perfectly positioned at the foothills of Beverly Hills/Bel Air, and minutes away from the Santa Monica beaches. Located across from UCLA and near the entertainment and spectacle of Sunset Strip, you’ll be living large in our luxury boutique hotel in Los Angeles.